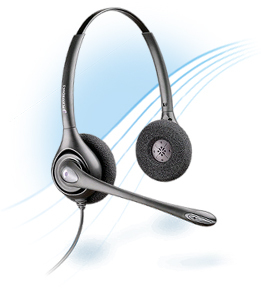 Headsets are an indispensable tool for contact centers and other voice-intensive applications. When it comes to connecting a headset to a phone or ACD terminal, users have two fundamental choices: a direct connect headset or a headset with the addition of an amplifier. This decision has implications on performance, particularly in the contact center. Making the right decision between these two options requires balancing cost and capabilities in the context of where the headset system will be used. For example, will the headset solution be deployed in a contact center or a loud environment? Will you have a variety of incoming call sources, such as cell phones, IP, and conference calls? As the name implies, direct connect headsets plug directly into the headset port of the phone equipment. Professional-grade headsets are designed to provide superior performance and have built in safety features for direct connect applications. Users adjust the headset volume using the volume control on the telephone equipment. You can also attach a headset to an amplifier, which in turn connects to the telephone equipment and ensures compatibility. While some phones—especially newer IP phones— provide a headset port that allows users to directly plug in a headset, many telephones do not, and consequently require an amplifier. 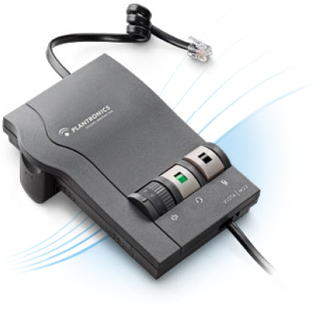 In this case, "amplifier" can be somewhat of a misnomer, since Plantronics amplifiers offer many capabilities beyond simply providing volume control and a means to physically attach a headset to a telephone. Plantronics amplifiers provide a number of features to enhance sound quality and thus improve productivity and customer satisfaction. Direct connect systems offer several business benefits. Compared with a headset and amplifier used in combination, they are less expensive and have a smaller footprint, optimizing valuable space on the desktop. Not all direct connect headsets are the same. Plantronics direct connect headsets offer extremely clear sound quality and superior reliability that comes from our long heritage of working with leading telecom providers to create breakthroughs in everything from wireless and IP technologies to our own patented sound innovations. In fact, Plantronics is the only headset provider offering Avaya-branded direct connect solutions, and when Cisco wanted to provide a direct connect headset port, Cisco contacted Plantronics to collaborate on the design. Plantronics direct connect headsets have the highest level of acoustic protection built in to assure optimal safety and comfort. Additionally, Plantronics offers a breadth of wearing styles to meet each user’s needs. As more and more phone makers incorporate headset ports into their equipment, buyers often assume that many important headset features are also built in and incorrectly assume that an external amplifier is redundant with capabilities in the phone system. This is not the case. For example, these simple direct connect ports typically provide only rudimentary volume control. Or, they may not even be aware of the many important capabilities—beyond volume up, volume down controls—offered by an amplified solution that are not included in either phone equipment or headsets. In addition to providing better audio than using the equipment with a direct connect headset alone, amplifiers such as the Plantronics Vista™ M22 Amplifier include a range of audio features that enhance the comfort and productivity of professional users. As a result, when choosing a headset solution, buyers should consider whether the more advanced features they need are included. In many professional and mission-critical applications, including phone-intensive environments such as busy professional offices or contact centers, amplified solutions not only provide additional important benefits that more than justify the increased upfront cost and desk space, but also provide necessary features. For example, advanced audio control helps to minimize operator fatigue, which can prove critical to customer satisfaction. Additionally, operators can respond to customers more efficiently without annoying repetitions and with fewer errors while inputting data. Some people believe that because many new IP phones have direct connect headset ports, amplifiers are not needed for IP. In fact, amplifiers are recommended even more because of latency and echo issues associated with IP voice communication. IP desk phones are not immune from echo even if they tout they have echo mitigation, since any mitigation they provide is for the handset. Due to the inherent nature of a headset, it requires additional echo mitigation which an amplifier provides. Automatic volume control allows users to select their preferred listening level. A call volume equalizer then adjusts the level of the incoming signal so that no matter the volume of the incoming call (cell phone, poor line, great line), the received audio is always at the same preferred level. Advanced echo management delivers quality audio on all calls—even when delays in the line would otherwise result in echo on the call, which is especially true on IP connections. This is important since phones are designed to provide echo management with a handset, not necessarily with a headset. Incoming noise reduction lowers incoming line noise for a better listening experience during quiet times between calls or while waiting for a response. Outbound noise reduction goes beyond the capabilities of a noise-canceling headset to further reduce noise when the user is not talking so that the caller is not disturbed by background noise. Protection against loud incoming sounds, such as fax tones, feedback or whistle blasts—reducing these within milliseconds to a more comfortable level so that the user does not have to adjust manually the volume or remove the headset. Investment protection: The Plantronics Vista™ M22 Amplifier is forward compatible and designed for your next wideband phone system. As the worldwide leader in lightweight, professional-grade headsets, Plantronics offers a wide selection of headsets to meet the unique and varied needs of both contact center agents as well as headset purchase decision makers. Both Plantronics direct connect headsets and Plantronics amplified solutions are excellent choices for improving productivity, reducing operator fatigue, and improving customer satisfaction. The best choice depends on the environment where you plan to put them in service. For many applications, the lower cost of a direct connect headset may make it the right choice. Plantronics offers the leading direct connect solutions. However, for noisy or call-intensive environments, or where operator comfort, productivity and safety are top concerns, the benefits of an amplifier-based solution far outweigh the slight incremental difference in costs. Whichever you chose, you can count on Plantronics for superior audio quality, service and reliability. After all, the vast majority of contact centers worldwide rely on Plantronics headsets and accessories.